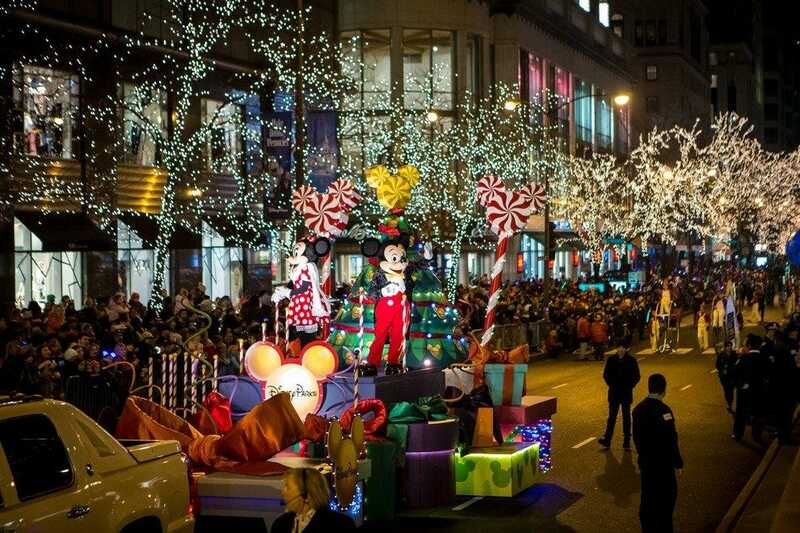 Mickey and Minnie Mouse are the grand marshals of Chicago’s 27th annual Magnificent Mile Lights Festival parade Saturday. The parade features 40 floats, helium-filled balloons, marching bands and performers on a route that extends down Michigan Avenue from Oak Street to the Chicago River. For 50 years, the trees along North Michigan Avenue have been illuminated to signal the official kick-off of the holiday season in Chicago and around the nation. With the help of over 600 volunteers, The BMO Harris Bank Magnificent Mile Lights Festival® encourages everyone to join in the spirit of the holiday season and enjoy a host of festive experiences along The Magnificent Mile®. Celebrate the magic of the Lights Festival with a book and a postcard series that highlights the colorful past of this cherished annual event! The BMO Harris Bank Magnificent Mile Lights Festival returns in 2018 with a full lineup of activities, starting on 4:00PM on Friday, November 16 and then again at 11:00 AM on Saturday, November 17. Free, family fun culminates in the grand Tree-Lighting Parade down North Michigan Avenue with grand marshals Mickey Mouse and Minnie Mouse from Walt Disney World® Resorts Florida. Start planning with the 2018 Holiday Activity Guide, including an event map, a schedule of events, and special offers around The Magnificent Mile! 4:00 – 8:00PM: Lights Festival Lane in Pioneer Court (401 N. Michigan Avenue) opens the evening before the parade with more than a dozen family-friendly activities from Chicago favorites and popular brands—plus live music and a visit with Santa Claus! Explore an interactive wonderland of holiday-themed activities, and sample treats from crowd favorites Garrett Popcorn, Frango, The Eli’s Cheesecake Company, and more. 11:00 AM – 4:00PM: Explore an interactive wonderland of holiday-themed activities at Lights Festival Lane in Pioneer Court (401 N. Michigan Avenue), including the BMO Harris Kid’s Zone. Santa Claus is always ready to greet guests, alongside more than a dozen holiday-themed activities. ALL DAY: Enjoy holiday experiences and special offers at participating retailers, restaurants, and attractions around The Magnificent Mile District! Plus, being a BMO Harris customer has it’s perks! Live musical performances return to the BMO Harris Bank stage this year! Enjoy free concerts on Saturday, November 17, plus meet-and-greets with your favorite artists. Don’t miss your chance to meet your favorite performers in person on Saturday, November 17! Meet & Greets require wristbands, first come first serve while supplies last. Please visit the BMO Harris Bank Helper Tent at Lights Festival Lane for more information. As early as 3:30PM: Dusable Bridge (formerly Michigan Avenue Bridge) closes to pedestrian traffic. 4:00PM: North Michigan Avenue closes to vehicular traffic between Oak Street and Wacker Drive. Watch on ABC 7 Chicago! 6:00 PM: Tune in live on ABC 7 Chicago for coverage of all the excitement! Want to watch the parade again? The broadcast is syndicated to more than 90% of the United States throughout the holiday season, so check your local listings! Start planning with our 2018 Holiday Activity Guide, including an event map, a schedule of events, and special offers around The Magnificent Mile!